Exposure is the most important principle in photography. It is vital that any photographer who is aiming to progress past point-and-shoot cameras understands the principle and knows how to put it into practice. It is, in fact, very simple, but may require some thought the first time round. In the first instance, there are a few terms that you should understand. The first of these is shutter speed. This is fairly self-explanatory, describing the length of time for which the camera’s shutter (which keeps light away from either the film or the image sensor, depending on whether you are using film or digital respectively) is open when a photo is being taken. Shutter speed is measured in seconds, with the standard scale starting at 1s (very slow) and decreasing up to 1/8000s. On this scale, each ‘step’ halves the length of time for which the shutter is open; thus, 1/500 and 1/250 will generally appear together.The second important term is aperture. In photographic terms, this refers to the size of the opening through which light is allowed to enter the camera. This is measured in ‘f-stops’, with (slightly confusingly) a smaller number meaning a larger opening; thus, f/1.4 is larger than f/2. The final term to understand is light sensitivity. This describes the sensitivity of the film or image sensor to the light which is being allowed onto it, and is measured in terms of ISO. This is described in more detail elsewhere on this site. The combination of light sensitivity, aperture and shutter speed determine the exposure that you will get. There is a basic rule of thumb for exposure, known as ‘sunny-16’. This rule says that, on a sunny day using ISO 100 film, a ‘correct’ exposure will generally be achieved with an aperture of f/16 and a shutter speed of 1/125. This rule can be extended to suggest that a good choice for shutter speed in these conditions is one ‘step’ over the ISO. The vast majority of cameras now include built-in light metering, thus removing the need for either guess-work or a separate hand-held meter. Depending on the age of your camera (if you are using film) you may need to set the ISO manually before you begin; with digital, this variable is at your fingertips constantly, and you can change it between frames. The camera will then take into account the conditions and offer you what it thinks are ideal settings. This will generally be presented as a series of lines, with a ‘correct’ mid-point, and gradually tapering off towards over-exposure on one side and under-exposure on the other. As you change shutter speed and aperture, an indicator will generally move along the line to give an idea of the exposure that the current set of variables will produce. On many cameras, it is possible to select the way in which the camera meters. You will often be given a choice between ‘matrix’ and ‘spot’ metering, and a few in-between. These options determine how the camera measures the light that is available. With full-matrix metering it will take readings across the entire frame, average out its readings, and produce recommendations based on the average. This is very useful if you are taking landscapes or other images in which you want an even light. In some circumstances, however, you may wish for one part of your image to be more or less highly exposed than the rest. In these cases, you can use spot metering to take a reading of a specific part of the frame. Often the photographer is given the option as to which part of the frame they want metered (generally the frame is divided into four or nine) but, if not, it is also often possible to use whatever spot option is available to you to meter for the relevant part of the frame, and then recompose your shot. 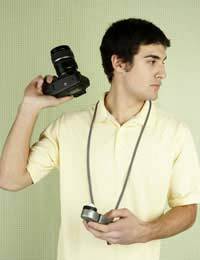 As with everything in photography, guidelines for exposure are not intended to be binding. There is no such thing as a ‘correct’ exposure, but a basic understanding of the principles that cause certain outcomes should help you determine your own.